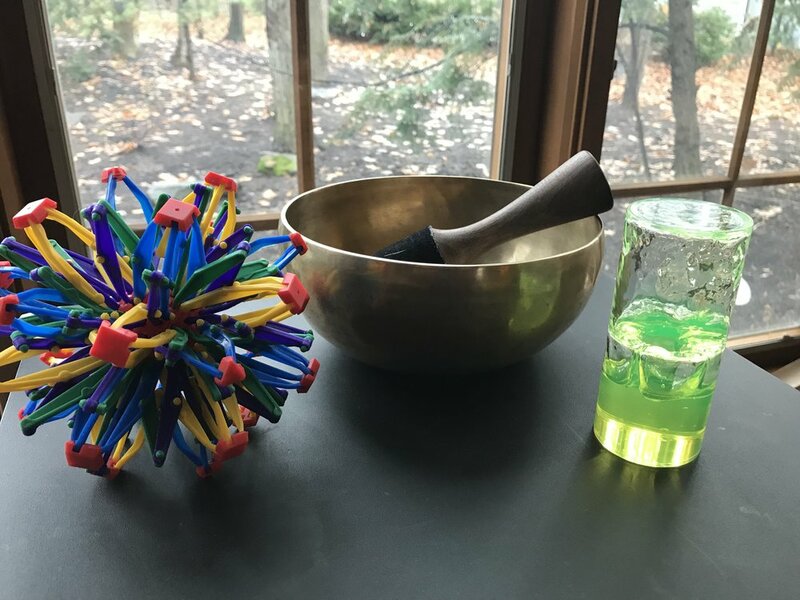 Singing bowl – This is a great tool for times of transition. Ring the bell and try to pay attention to the sound of the ringing for as long as you can hear it…kids love this challenge! This helps them practice sitting still and quiet. Hoberman sphere – This is a fun visual for children to see what filling up their belly with breath looks like. 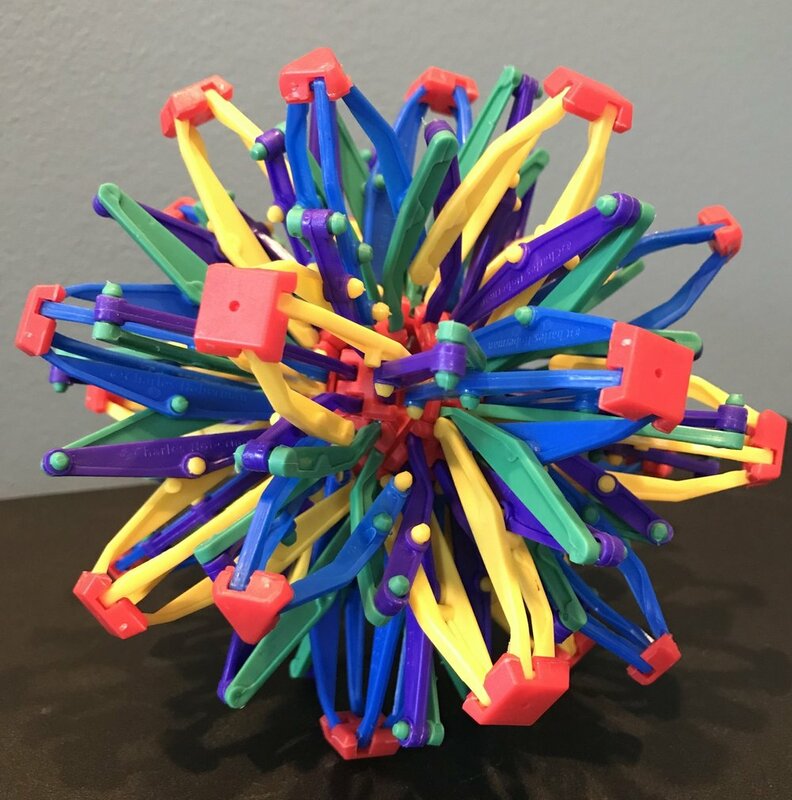 Pairing with your inhales and exhales, expand and contract the hoberman sphere slowly to help practice their belly breathing, which is known to have a calming effect. Ooze timer – Another fun visual for a “calm down” toolkit. Kids (and adults, let’s be honest!) love to watch the ooze slowly fill up one end while watching the air bubbles pop on the other end. You can try having older children imagine negative thoughts popping at the bubbles pop. Breath – Ahhhhh. Something we always have with us. It feels so good to take a nice deep inhale through our nose and let an audible “ahhhhhh” out of our mouth. You can also try to pair it with shrugging your shoulders up by your ears as you inhale and releasing down on the exhale. Another good trick for kids is to pair the inhale/exhale with tracing their 5 fingers on one hand with the pointer finger on the other hand. Breathe in, trace your finger to the tip of the thumb/breathe out, trace back to palm and continue onto next finger for a total of 5 breaths. Apps – My favorite mindfulness/meditation app is Insight Timer. There are thousands of meditations to choose from for adults and children alike. You can also just set a timer if you want to sit in silence for a bit. There’s a tracker of how often and how much you meditate that motivates you to keep up with your practice. Slow down and remember to bring small moments of true presence throughout this season! Have a safe, peaceful, and heart-filled holiday season from Mindful Roots!